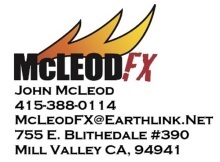 John McLeod will be available for a work commitment starting in January 2015. He is currently on location in LA for commercial work and small jobs through mid December 2014. Bay Area rentals are available at all times. Please call 415-388-0114 to schedule pick up and delivery times.